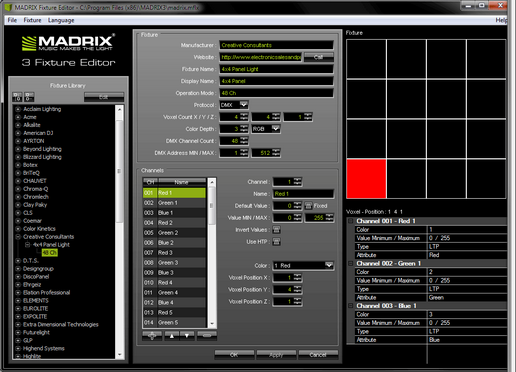 LED fixtures are implemented using the MADRIX Fixture Editor. The fixtures are stored in the MADRIX Fixture Library [madrix.mflx]. ▪ implement and add fixtures to the library yourself. ▪ Always make a backup of the madrix.mflx before and after applying any changes. ▪ When updating your MADRIX version, the Setup [Auto Installer] will automatically create a "madrix.mflx.bak". This file is a backup of your old MADRIX Fixture Library. Moreover, the Setup will overwrite the current madrix.mflx completely to update the library. ▪ Please quit MADRIX before using the Fixture Editor and making any changes to the MADRIX Fixture Library. ▪ You can learn more in the separate user guide for the MADRIX Fixture Editor.